Ta-da! May I present the OYW 30 minute cami turned lace tunic. (I'm not sure if that's what it's called in the book or not, but 30 minute cami was the working title.) This tunic is what I had planned to wear if I had been able to attend the release party. With a jacket of course. I mean c'mon, it's November --- and chilly. The fabric is a rayon lace purchased a few years ago from Fabric Mart Fabrics. It was marked dry clean only but I tossed it in the washer on a delicate cycle to see what would happen. The washing made it very soft and flowy. The lining is a silk jersey knit chosen for the color - not so great against my face, but perfect for lining this tunic. I submitted the simple cami project remembering how much I loved sewing and wearing those types of tops in the early 80s. I also hoped that it would be used as a starting point for some creativity. 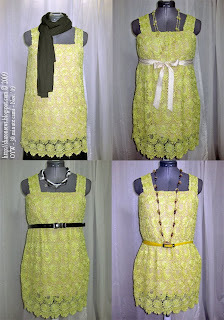 To turn the cami into a lace tunic, I made some very simple changes to the pattern and instruction. Let me walk you through them. Please note that this lace tunic does take more than one yard of fabric. In fact, I used so I could match the lace pattern and have the scallops along the hemline. 1) Lengthen the cami pattern to your desired tunic length. I played with the edge of the lace fabric to determine where it would look best on me before deciding to make the tunic 20" long. I also added width to the lower edge giving me more room in the hip area. 2) Cut front and back from lace fabric. In retrospect I should have cut these out single layer because I was working with lace that had a distinctive pattern and I managed to get the pattern off slightly. You, of course, will not make that same mistake! 3) Cut a front and back from a contrast lining if using lace fabric. Unless you're bolder than I that is. I cut the lining 1-1/2" shorter than the tunic and hemmed it just by serging the bottom edge. 4) Sew the side seams in the lace tunic as well as the lining tunic. You'll now have two tunics - one lace, one lining. Place the lining inside the lace matching the upper edges; baste together. 6) Cut four shoulder straps 3-1/2" wide by 14" long (or whatever measurement you came up with in step five.) Two from the lace, two from the lining. 8) Pin the straps 5" in from the side seams on the front, and 5" to 6" in from the side seam on the back. Try on and adjust if necessary. Baste in place. 9) Sew the elastic casing. Using 1/2" bias tape, sew the tape to the top edge of the tunic and sew in place using a 1/2" seam allowance. Trim the excess top fabric. Turn tape to the wrong side of tunic and press. 10) Make the casing for the elastic. Separate the lace and lining sections. Sew the tape along the bottom edge, securing only to the lining fabric, to create the casing. Be sure to leave an opening at one side seam to insert the elastic. 11) Insert elastic. Measure a piece of 1/4" wide elastic to fit comfortably around your upper chest. Cut and insert into the casing. Secure ends of the elastic together. Sew the opening in the casing closed. 12) Add thread loops. Thread loops, using a coordinating thread, were added to hold any belt or ribbon that might be worn below the bust. ...or add a ribbon and bow. As you can see, the finished lace tunic appears quite different than the 30-minute cami sample shown in the book. That is really pretty!!! It reminds me of something you would buy from anthropologie. What a cute tunic! It would be perfect for a Holiday party. I couldn't wait any longer for my copy to arrive (I have a project appearing in the book, too! ), so I headed out to Borders to pick up a copy. A very nice employee had to trek to the back room to unpack one from a box for me. I think I frightened him with my excitement. I couldn't help it! Really love the tunic! I am definitely going to try it out. Wow, that is great! I didn't know you had an entry in the book. Thanks for sharing this. I will wait til summer to try but have bookmarked this for future use. Hope you are feeling better. Great result! Looks so sophisticated. Totally cute. And congratulations for getting published again. Love it! Congrats on your projects being published in the book! I just got my copy of the book, and it is really great. Can't wait to show it to my sewing/crafting group.